Ana and Tami both chimed in soon after this one was posted, so now this Vintage Curious George is on his way to Baz, ready to make his girlfriend’s Christmas something special this year. We have a mailing list of people looking for the different versions of this monkey. I’m looking for a grey monkey my girlfriend had as a kid. Sadly I don’t know the make or brand or if it was a character, but I would really like to get her a replacement. I only have the one picture, and it’s an item I’ve never seen myself. This is her treasured childhood possession. I wanted to find one or get a replacement made in time for Christmas, as I think it would be the sort of thing that would make her happy beyond measure. 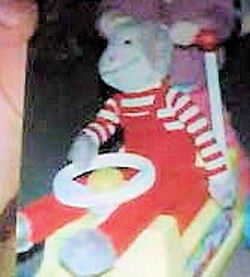 If you can help Baz find this Large Gray Monkey Wearing Red Overalls and Red Striped Long Sleeved Shirt, THIS SITE IS NO LONGER ACTIVELY MANAGED. Please use Our FREE FACEBOOK GROUP, including #092108-2 in the subject, . I think the one in the picture had lost his hat. 300226000611 Ebay item number for the curious george monkey. That’s got to be it. I’ve emailed him. Thanks to both of you! !